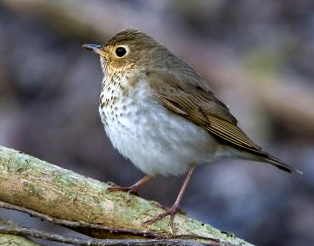 Imagine that you are a Swainson's thrush. You weight about an ounce, yet your fat must sustain you through a grueling migration (mostly at night) over thousands of miles. During daytime rests on the ground, you must still be alert enough to avoid hungry predators. The ordeal must last for weeks. No human could cope with that 24 hour stress, but the bird mind includes a unique design feature that makes it possible. This tiny bird is able to split its brain in half while migrating -- letting one side sleep, while the other brain hemisphere remains awake. Researchers noticed one eye closes while the other eye is conscious and watchful. Monitoring the thrush's brain waves in simulated day/night migration cycles has confirmed that one side of the brain shows sleep patterns while the other side continues to function normally. Similar experiments with groups of resting ducks have shown a bird can actually choose which of the two sides of their brain rests. The duck keeps the watchful outside eye on the edge of the group open, and corresponding brain hemisphere alert for danger -- while the other half of its brain stays sound asleep.